I love the Chargers in all white. Chargers honestly never need to wear the navy pants again. 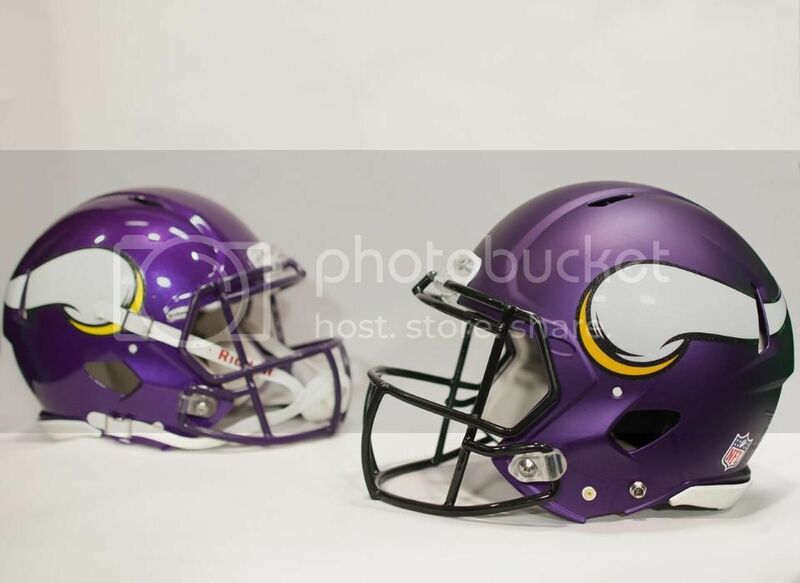 Watching the Vikings-Patriots game, despite the loss, our helmets looked AMAZING while wet. The gloss and the shine looked so good! Reminded of the old 2006-2012 glossy helmets. 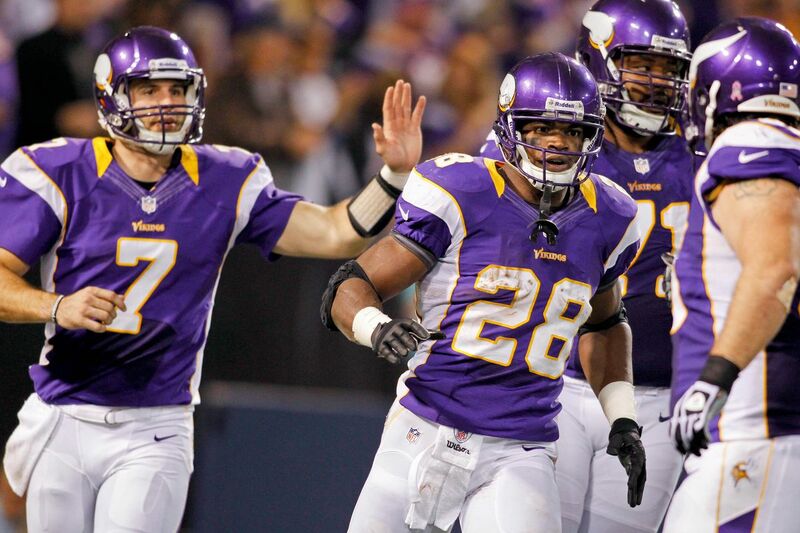 Personally the best helmets the Vikings have ever had. Purple Facemask (rather that black) is a bonus. 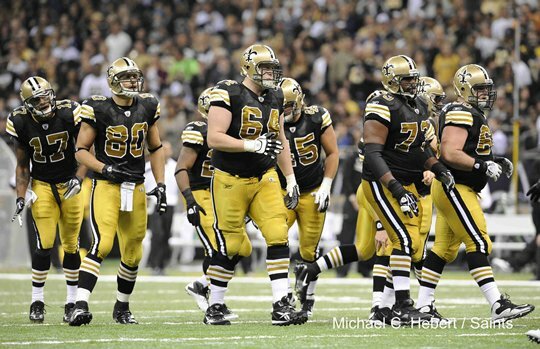 For the love of god, SAINTS WEAR YOUR GOLD PANTS ALREADY!!!! We need Detroit in blue pants and the Cards in red. That is a nice looking game. As is Baltimore in purple pants in KC. But really, what do you Chargers all white fans like about that look? It is so drab and lacks personality. The helmet, which is one of the better in the league I think, stands out so much more when the navy pants contrast with all the white above the waist. It just gets lost when basically the whole uniform is white. I can't stand the "clean, traditional" argument; all white is boring to me. Period. Some teams like the Panthers and Cardinals can pull it off because they have adequate accent colors, but when the helmet and jersey are both white, the uniform could clearly benefit from some color in most cases. Is there a way to like this post multiple times? I hate when teams have a great uniform system and ruin it for no reason. Wear the black striped socks from the opposite set that has the black jersey. The white on white jerseys from that set look so georgous with the gold player and TV numbers and nobs. Well, with next season being NFL-100 it would be a great reason to do they inevitable and lift the one-helmet shell rule and do an NFL-100 Legacy season. Let the Redskins bring back their leather simulated helmets to wear and have both teams matching up in throwbacks during the same game just as AFL-50 Legacy games in 2009. It would really excite everyone, and the NFL would make a killing $$$ in team apparel sales. Have NIKE produce all 32 teams in both a home & away versions of throwbacks, and they wouldn't necessarily have to be one from the same season. Let them choose separate seasons for home & away IF they so choose. Like Buffalo for example, they could choose to wear the 1973 away throwback and 1963 home throwback. If NIKE can produce new soccer kits for all these worldwide clubs who change both their home and clash kits every season, and many with a 3rd kit and Champions League or Europa League kit also.. If NIKE can produce for all these leagues globally then surely they should be handle a job of this size, and I would hope that plans should probaby already be in the works. I had seen a concept of a simulated leather helmet, but unlike Washington's it had a design that actually made it look like the old leather helmet including the stitching, and with face-masks of course. I believed it was designed by a company that designs NFL goaltenders head & face gear with those famous artists renderings. 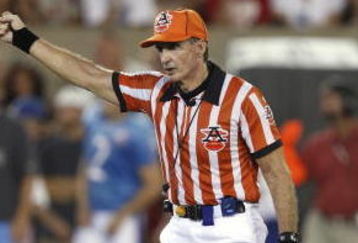 Here's that old AFL referee kit that 'insert name' made mention of as was worn in 2009 for the AFL-50 Legacy games. Would somebody with skills in using Photoshop please show us how Detroit would look with their road socks switched to white (or silver too) with the same stripes from the jersey sleeves in the centre to compliment those Honolulu Blue pants? Also, nobody makes mention of this but the older pants used to have a different belt color to compliment the contrast of the pants and uniform itself. These Lions pants should have a silver inner/outer belt for those pants. Bills used to have a red belt with their blue pants when those pants debuted in 1973. Bucs in color rush again this week. I guess they're pulling a 2017 Browns and avoiding their main dark jersey, which is really dumb. No other reason they would wear white at home through November. They haven't worn them since their Week 1 loss to Tampa, and have won all their games (minus CR and Last Week) wearing Black Pants. Superstition I guess? Looks like the Cardinals will be wearing Black tops with White pants. They look decent, and I own a black jersey, but I am hoping they have some sort of refresh soon. Unlike them to wear black this late in the season. Such a shame. Amen to that! Now it’s time to make powder blue their main jersey. Could the Titans perhaps break out their Columbia Color Rush Thursday night vs the Jags? Glad to see a clean Skins and Eagles matchup. Wouldn’t mind seeing the yellow pants make a few appearances though during the season.